The Collie is one of the most popular breeds in America today due to its gentle, soft-mannered, and devoted nature. It is very loyal to its owners and to its family. Because it has been a hard-working dog since the beginning, its physique is designed to have a physical workout at least once a day. If it does not get an adequate amount of exercise, it can become discontent causing it to act out. Its a very bright breed, and at times it can be stubborn. Exercise will help reduce its stubbornness. It may nip at children’s heals when playing, so it is important to watch your Collie if it is playing with young children. Exercise for this breed typically will require a good, long walk or a jog. Hiking is also a favored activity by the breed because it likes to explore as well. Herding, due to the dogs roots, is also a wonderful exercise if you have a flock for your Collie to herd. It can survive outdoors, but it is recommended to live in a home, as it is certainly a loving, family dog by nature. The coat will need tended to on a weekly basis at least to ensure that the hair remains untangled and smooth. Minor health concerns seen in the breed typically include seizures, microphthalmia, Chronic Hip Dysplasia, and cyclic neutropenia. However, these conditions are not often seen. This breed is typically sensitive to ivermectin. Homozygous merles are often seen to have visual or hearing problems, so it is important to get your Collie tested for such conditions. If you keep your Collie healthy, it should live for approximately 8-12 years. The average full grown weight for a Collie is between fifty and seventy five pounds. The history of the Collie is as vague as the origination of its name. It is speculated that the Collie may have been derived from the same origination as the Border Collie. The name is speculated to have been derived from a word meaning useful, in Gaelic. This described the dog immensely, as they were very useful stock dogs. The Celts valued them most and it was the Celts that first settled in the British Isles. 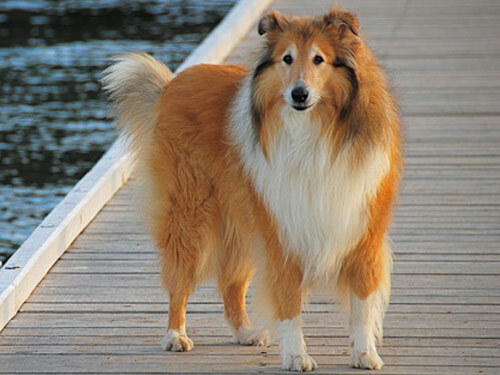 The Collie’s existence does not date back before the 1800s, as that is when there are first signs of the breed. Both types of collies, rough and smooth-coated, existed at that point in time. Rough coated Collies were expected to stay out with their herd in any type of weather condition, as they were better suited for this task then the smooth-coated Collies. Over the years, the breed became a mentionable amount taller and more refined overall. In 1860, Queen Victoria began to take quite a fancy to the breed and began a Collie Kennel causing their popularity to sky rocket. When the Collie made its way to American grounds, it became extremely popular with the movie and television series coined Lassie that was about a Collie. This helped push the breed to become one of the most favored breeds in America today.